New research from the University of Iowa answers a question that has vexed cystic fibrosis (CF) researchers for almost 25 years: Why don’t mice with CF gene mutations develop the life-threatening lung disease that affects most people with CF? The research team, led by Michael Welsh, discovered an answer to this long-standing scientific puzzle, and in doing so, identified a proton pump that could be a target for new CF therapies. They published their results Jan. 29 in the journal Science. 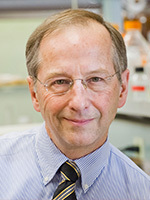 “Since the first CF mouse was reported in 1992, I have been asked hundreds of times, ‘Why don’t CF mice have respiratory host-defense defects and develop lung infections?’” says Welsh, who is a professor of internal medicine, molecular physiology, and biophysics; a Howard Hughes Medical Institute Investigator; and director of the Pappajohn Biomedical Institute at the UI. In answering this question, Viral Shah, first author on the study and a student in the Medical Scientist Training Program at the UI Carver College of Medicine, homed in on the thin layer of liquid that covers the mice’s airways, i.e., the tracheal and bronchial passages. Shah and his colleagues studied the liquid’s acidity, the importance of which was revealed in earlier UI studies using pigs with CF. That work showed that the CF pigs had an abnormally acidic airway liquid, and that increased acidity impaired the ability of their airways to fight off infection. Bacteria (Pseudomonas aeruginosa) are shown on the surface of a CF-affected airway. Image courtesy of Viral Shah. Shah explains that, normally, two opposing processes control airway acidity. The cystic fibrosis transmembrane conductance regulator (CFTR) channel secretes bicarbonate, a base. That process is countered by the secretion of protons—an acid. The balance tightly controls the acidity of liquid in the airways. In people, pigs, and mice with CF, the CFTR channel is lost, stopping the flow of bicarbonate into the airways. When that happens in people and pigs, their airway liquid becomes more acidic, reducing their ability to fight infection. But in mice, the airway liquid does not become more acidic, and they are not prone to infection. That fact led the scientists to ask what secretes acid into the airways of people and pigs that is missing in the mice. They discovered that a proton pump called ATP12A is responsible. 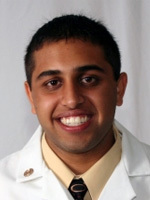 Shah and his colleagues made the discovery by comparing airway tissue from humans, pigs, and mice. The scientists showed that blocking ATP12A in airway tissue from pigs and humans with CF reduces the acidity of their airway liquid and restores their airways’ defenses against infection. Conversely, putting the ATP12A proton pump into the airways of CF mice increases the acidity of the liquid and predisposes the CF mice to bacterial infections. Shah adds that targeting ATP12A could potentially be helpful for all forms of CF, regardless of a patient’s CFTR mutation, because ATP12A is independent of CFTR. The CF pig model was developed in 2008 by Welsh and his research team at the UI, with colleagues from the University of Missouri. The CF pig closely mimics human CF disease, including the lung problems absent from CF mice, and has proven very useful in advancing our understanding of CF lung problems. The research was funded in part by grants from the National Institutes of Health, the Cystic Fibrosis Foundation, and the Roy J. Carver Charitable Trust. MP-376 is an inhaled formulation of levofloxacin, a fluoroquinolone antibiotic. QUINSAIR is contraindicated in patients with hypersensitivity to levofloxacin, a history of tendon disorders related to fluoroquinolones, epilepsy, or who may be pregnant or breast feeding. The safety profile of QUINSAIR has been evaluated in two double-blind, placebo-controlled studies and in an active comparator study in which the most frequently reported adverse reactions were cough/productive cough, dysgeusia, and fatigue/asthenia. NM001 (Lynovex®) has a unique, dual antibacterial-mucoactive mode of action which aggressively tackles both of the major clinical features responsible for progressive lung deterioration in cystic fibrosis. NM001 not only kills Gram-negative and Gram-positive respiratory bacteria (including Pseudomonas aeruginosa and Burkholderia cepacia) but prevents and disrupts formation of the slimy biofilms which these pathogens create in order to establish long-term, antibiotic insensitive infections/colonies in the cystic fibrosis lung environment. Experiments with sputum from cystic fibrosis patients have demonstrated NM001 is active against the panel of multi-drug resistant cystic fibrosis pathogens within the complex and challenging matrix of cystic fibrosis sputum and that NM001 reverses resistance/insensitivity to antibiotics in these microbes. NM001 (Lynovex®) is also mucolytic; acting to disrupt the mucus in cystic fibrosis patients’ airways. In vitro and ex vivo tests have shown NM001 to be more effective than currently available mucoactive agents. Mul-1867 is being developed against multidrug-resistant bacteria and fungi. Initial testing indicates Mul-1867 to be a significant breakthrough in the war on lung infections in patients with cystic fibrosis. Mul-1867 is a promising antimicrobial for the treatment and prevention of several pathogens, including P.aeruginosa, S. aureus & B. cepacia. First pre-clinical test show promising results compared to available drugs. AeroVanc™ (vancomycin hydrochloride inhalation powder) is a proprietary inhaled dry powder form of vancomycin in a capsule-based device designed for convenient self-administration. Vancomycin, administered by injection into a vein (also called intravenous or IV administration), is the antibiotic of choice for MRSA-related bronchopneumonia, however, the inconvenience of IV administration, poor penetration into the lungs and systemic toxicities limit its use in a chronic setting. By delivering vancomycin directly to the site of infection in the lungs, the hope is that AeroVanc will improve clinical efficacy and reduce adverse effects due to systemic drug exposure. AeroVanc has been granted orphan drug status (link) by the U.S. Food and Drug Administration (FDA). POL7080 is a Pseudomonas specific antibiotic with a novel mode of action. Pseudomonas aeruginosa is a bacterium commonly found in the environment which can give rise to serious, life-threatening infections in humans and animals. Pseudomonas aeruginosa is regarded as an opportunistic pathogen and serious infections in various types of tissue develop in patients with compromised or reduced immune system, e.g. in case of AIDS or cancer treatment. The Infectious Diseases Society of America (IDSA) listed Pseudomonas aeruginosa as one of the six most dangerous drug-resistant microbes. Pseudomonas like other Gram-negative bacteria is difficult to treat with existing antibiotics and many bacteria develop resistance after unsuccessful treatment. Thus, therapy of Pseudomonas infections is increasingly difficult. POL7080 is the first of a new class of antibiotics derived from the PEM Technology platform. In preclinical studies the compound was highly active on a broad panel of clinical isolates including multi-drug resistant Pseudomonas bacteria with outstanding in vivo efficacy in septicemia, lung and thigh infection models. Its novel mode of action has been published in Science (2010, 327, 1010-1013, DOI). Phase I clinical trial in healthy volunteers in Europe was successfully completed demonstrating the clinical safety and tolerability of POL7080. All primary study objectives were achieved in this Phase I trial. 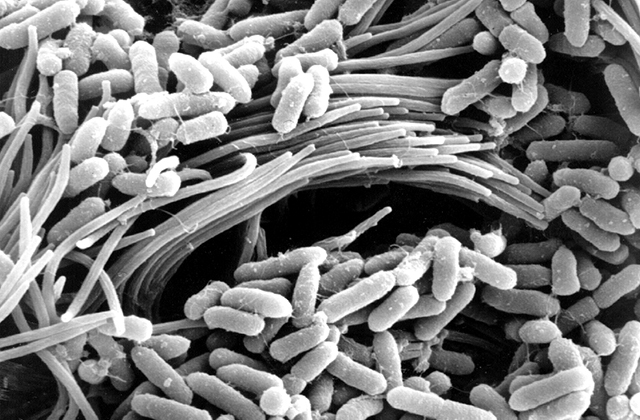 EBX-001, which consists of two bacteria-fighting compounds, eliminates persistent drug-resistant Pseudomonas aeruginosa in cystic fibrosis patients better than the antibiotic component of the therapy alone, a study reports. A therapy that could revolutionize the battle against antibiotic-resistant lung infections eliminated resistant Staphylococcus aureus in a lab, a study reports. Synspira is developing proprietary modified polysaccharide molecules that facilitate mucus expectoration and biofilm disruption, thereby rendering otherwise protected bacteria susceptible to antibiotics. Synspira’s lead molecule, SNSP113, seeks to treat pulmonary exacerbations in cystic fibrosis by controlling infection and inflammation. SNSP113 reduces mucus adhesion and viscosity, breaking up bacterial biofilms, and potentiating antibiotic activity, improving lung function. On the lung’s surface, mucus is moved up and out of the airways by structures known as cilia to keep inhaled bacteria and harmful substances from remaining in the respiratory system. In cystic fibrosis (CF), the mucus is thick and viscous, preventing free movement of the cilia and allowing bacterial colonies to form biofilms. Inhaled SNSP113 interacts with native glycoproteins in mucus and polysaccharides in bacterial biofilms to loosen the mucus and disrupt the biofilms. In doing so, SNSP113 allows normal clearance to occur and exposes bacteria previously protected by biofilms and mucus, making them more susceptible to antibiotics. Acebilustat is a small-molecule drug that works by blocking production of an inflammatory biochemical called Leukotriene B4 (LTB4). Resunab is designed to trigger the resolution of chronic inflammation by binding to and activating the CB2 receptor on immune cells (in effect, turning inflammation “off”). Airway inflammation begins early in the disease course, with increased neutrophil infiltration present in infants as young as 4 weeks of age. The inflammatory process persists throughout the patient’s life, gradually leading to bronchiectasis, irreversibly damages the airways, and progressive decline in lung function. Pulmonary disease accounts for most of the morbidity and mortality in patients with cystic fibrosis although other organs, such as the pancreas and liver, are also affected by inflammatory damage in cystic fibrosis. The importance of inflammation (both underlying and infection-derived) is universally accepted as contributing to the disease progression, but current anti-inflammatory treatments present a paradox: while treatment with systemic steroids and high doses of ibuprofen (a common NSAID) are effective at improving the symptoms of the disease, the side effects associated with these drugs are severe, and as a result, are infrequently used. There is a strong consensus that a safe, effective chronic anti-inflammatory therapy will be of tremendous value to patients potentially impacting the quality of their lives as well as extending it. Resunab™ is a first in class, synthetic oral endocannabinoid-mimetic drug that preferentially binds to the CB2 receptor expressed on activated immune cells and fibroblasts. CB2 activation triggers endogenous pathways that resolve inflammation and halt fibrosis. Resunab has the potential to be a safe and potent anti-inflammatory drug with a unique mechanism of action to treat a range of chronic inflammatory diseases. *Bacterial CFU (colony-forming unit –CFU) is a measure of viable bacterial or fungal cells.CFU measures only viable cells. For convenience the results are given as CFU/mL (colony-forming units per milliliter) for liquids, and CFU/g (colony-forming units per gram) for solids. Pre-clinical and Phase 1 clinical studies (123 subjects) have shown Resunab to have a favorable safety, tolerability and pharmacokinetic profile. It has also demonstrated promising potency in pre-clinical models of inflammation and fibrosis. Resunab triggers the production of “Specialized Pro-resolving Lipid Mediators” (SPMs) that activate an endogenous cascade responsible for the resolution of inflammation and fibrosis, while reducing production of pro-inflammatory eicosanoids and cytokines. Resunab has direct effects on fibroblasts to halt tissue scarring. In effect, Resunab triggers endogenous pathways to turn “off” chronic inflammation and fibrotic processes, without causing immunosuppression. Resunab has demonstrated promising efficacy data in several pre-clinical models including ones specific to cystic fibrosis and scleroderma. Patient ex-vivo data showed similar promise. Resunab is currently being evaluated in three separate Phase 2 clinical trials for the treatment of cystic fibrosis, diffuse cutaneous systemic sclerosis and dermatomyositis. To learn more about Corbus’ ongoing clinical trials, please click on one of the below links or visit clinicaltrials.gov. LAU-7b is a reformulation of fenretinide, a semi-synthetic retinoid derivative. LAU-7b is administrated orally and is under clinical development for the treatment of cystic fibrosis (CF) as a potential disease-modifier addressing the immuno-inflammatory pathway. Oral administration of fenretinide was shown to correct the lipid imbalance in lungs and plasma of specific animal models of CF, resulting in reduced lung inflammation and dramatic decrease in the severity of pulmonary infections with Pseudomonas aeruginosa, a bacterium involved in perpetuating the inflammation-infection vicious cycle in CF. Patients with CF have an innate imbalance of essential fatty acids with increased arachidonic acid (AA) levels and decreased docosahexanoic acid (DHA) levels. An increasing amount of evidence suggests that this lipid imbalance is a very early effect in CF associated with the mutations in the CFTR gene and playing a major role in the infection-inflammation vicious cycle that leads to respiratory failure. Fenretinide, an orally-available semi-synthetic retinoid, is an investigational drug candidate that was explored extensively for its potential therapeutic use in various indications including cancer, obesity, type 2 diabetes, rheumatoid arthritis, dry age-related macular degeneration, and more recently cystic fibrosis. Fenretinide was never commercialized. Although the complete mechanism of action in CF is not yet elucidated, it is proposed that fenretinide corrects the AA/DHA imbalance and inhibits macrophage inflammatory mediators via the extracellular signal-regulated kinase (ERK) pathway. Fenretinide was also shown to inhibit the activation of the pro-inflammatory transcriptional nuclear factor (NF)-kappaB, as well as inhibit the downregulation of peroxisome proliferator-activated receptor gamma (PPARγ). The proinflammatory response and altered fatty acid metabolism in CF are linked to decreased expression of PPARγ in epithelial cells and PPARα in macrophages. The innate lipid imbalance, known for decades as one of the hallmarks of CF, is emerging as a new target with the potential to address the link between the genetic defect and the altered immuno-inflammatory response, which remains an enigmatic pathogenic pathway in CF. The observed fatty acid abnormalities could play a major role in the initiation, maintenance and degree of progression of the infection-inflammation vicious cycle. Thus, the concept of modulating lipids in CF is an innovative therapeutic approach that can complement current therapies and has the potential to improve CF patients’ immuno-inflammatory response. Follistatin modulates inflammatory processes and prevents accompanying fibrosis. One of the advantages of follistatin as a therapeutic for inflammatory and fibrotic disorders is that it is a naturally occurring glycoprotein expressed by many cells in the body. Its primary function is to bind to and neutralize activins. Activins are a critical component of the innate immune response and in the development of fibrosis. Numerous studies have shown activin levels increase in the serum and various tissues in acute and chronic inflammatory diseases. Activins are also known to stimulate fibrosis and tissue repair and also mediate the fibrotic actions of other key growth factors. Follistatin therefore offers great potential for modulating inflammatory processes and preventing or resolving accompanying fibrosis. Preclinical safety and toxicology studies supporting the Company’s Phase I clinical program were completed during the year. The studies were performed in Canada by a leading inhalation toxicology contract research organisation (CRO) in rats and cynomolgus monkeys. The studies were designed to satisfy international guidelines and conducted by the CRO in compliance to international regulatory standards and principles. In all studies, inhaled PB01 was well tolerated in the two animal species tested with no adverse effects observed in either species at any of the dose levels evaluated. These results provide the Company with a high level of confidence that orally inhaled PB01 will be well tolerated and non- toxic in human subjects for the anticipated range of therapeutic doses over the intended period of drug exposure. A first-in-human Phase I clinical study of inhaled PB01 therapeutic is planned to commence in September 2015 for completion in mid-2016. The study will evaluate the safety, tolerability, pharmacokinetics and pharmacodynamics of single and multiple doses of orally inhaled PB01 administered to healthy, adult male subjects. The trial will be undertaken in three stages; two in Australia and the third in the UK. All stages will be randomised, double blind, placebo-controlled studies. Stage 1 will be a single ascending dose study evaluating four PB01 dose levels. Stage 2 will be a multiple ascending dose study evaluating up to three PB01 dose levels administered daily over 14 days. Stage 3 will be a single dose study incorporating an inhaled inflammatory challenge to induce mild lung inflammation in participants. The objective of this stage will be the evaluation of the biological effect of PB01 on biomarkers of lung inflammation and is therefore expected to provide an indication of efficacy. PBI-4050 is an orally active lead drug candidate with excellent safety and efficacy profiles confirmed in several in vivo experiments targeting fibrosis. Fibrosis is a very complex process by which continuing inflammation causes vital organs to lose their function as normal tissue is replaced by fibrotic scar tissue. The proof of concept data generated to date confirms our lead drug candidates’ anti-fibrotic activity in several key organs including the kidneys, the heart, the lungs and the liver. POL6014 is a novel, highly potent, selective and reversible inhibitor of human neutrophil elastase (hNE), a key target for the treatment of respiratory diseases like chronic obstructive pulmonary disease (COPD), cystic fibrosis (CF) and alpha-1-antitrypsin deficiency (AATD). Cystic fibrosis (CF) is a lethal hereditary disease characterized by abnormal transport of Cl- and Na+ across the epithelium, leading to viscous secretions and neutrophil-dominated lung inflammation sustained by bacterial infections. Activated or necrotic neutrophils liberate proteases that cause damage to structural, cellular and soluble components of the pulmonary microenvironment. The progressive lung disease determines the morbidity and mortality of patients. Neutrophil elastase is the major protease released in the lung of CF patients and plays a major role in the disease process. POL6014 now offers the opportunity for a well controlled clinical study with a highly active and selective elastase inhibitor which can lead to an improved lung function. Preclinical pharmacological studies have shown that POL6014 inhibits the aggressive, tissue degrading enzyme neutrophil elastase in a highly potent, selective and reversible manner. After local application to the lungs by inhalation POL6014 reaches high concentrations in the lung while the systemic exposure remains low, thus reducing the risk of side-effects. Exploratory toxicology studies suggest that POL6014 is well tolerated when chronically inhaled as an aerosol. POL6014 is in Phase I clinical development. RPL554 is a dual inhibitor of the phosphodiesterase 3 (PDE3) and phosphodiesterase 4 (PDE4) enzymes. This dual inhibition enables it to combine bronchodilator and anti-inflammatory properties in one compound, differentiating it from existing drug classes used to treat COPD, including corticosteroids, beta2-agonists and anti-muscarinics. RPL554 also activates the Cystic Fibrosis Transmembrane Conductance Regulator (CFTR), which is beneficial in reducing mucous viscosity and improving mucociliary clearance, thereby potentially also making it an attractive therapy for the treatment of CF. enabling delivery directly to the lung by inhalation, thereby maximizing pulmonary exposure to RPL554 while minimizing systemic distribution and potential adverse events. By acting as an inhaled, dual inhibitor of PDE3 and PDE4 and stimulating the CFTR, we believe that RPL554 has the potential to be a more effective and better tolerated treatment of COPD than existing standalone PDE4 inhibitors. We also believe these properties give RPL554 broad potential applicability in the treatment of other respiratory diseases, including CF. Pulmozyme cuts apart extracellular DNA making the thick, sticky mucus that your lungs produce thin and loose. Pulmozyme is a commonly prescribed medicine that is unique in the way it works. Picture how a pair of scissors can be used to cut something into smaller pieces. Similarly, Pulmozyme cuts apart extracellular DNA by acting like an enzyme* naturally found in the lungs. By cutting this extracellular DNA, Pulmozyme helps make the thick, sticky mucus that your lungs produce thin and loose. Bronchitol works by rehydrating the airway/lung surface and promoting a productive cough. The inhibition of ENaC with Parion compounds blocks the major pathway for mucus dehydration in the lungs, maintaining the viscosity (or stickiness) of mucus such that it can be cleared by the cilia. The drug functions as an epithelial sodium channel (ENaC) inhibitor which helps to hydrate the airways in patients better assisting the movement of mucous from the lungs. Citramel is a liquid delivered to the lungs via a nebuliser. 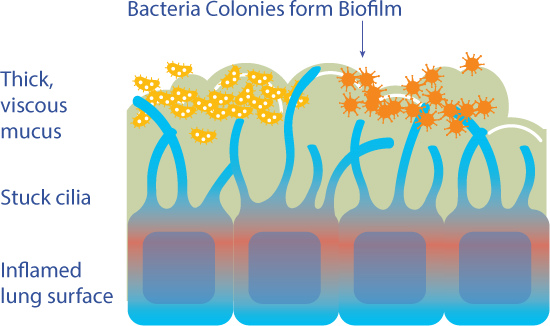 The formulation targets the biofilms in CF mucus. Spyryx is advancing inhaled peptides specifically designed to degrade ENaC so that this absorption can be blocked to enable airway fluid volumes to go back to normal levels. Spyryx Biosciences Inc. is developing inhaled peptides for cystic brosis that inhibit the sodium channel responsible for regulating uid volume in the lungs. The peptides could o er a pan-genotypic treatment that is more e cacious than therapies targeting CFTR. CF is caused by defects in the cystic brosis transmembrane conductance regulator (CFTR) channel that result in depletion of airway surface liquid and abnormally adherent mucus. 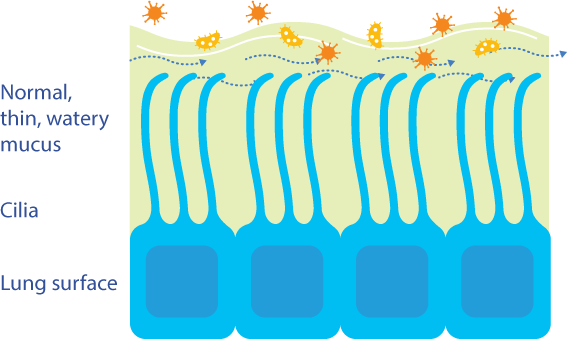 Spyryx’s peptides target the epithelial sodium channel (ENaC), which conducts sodium and water away from the airway surface, and becomes hyperactive when CFTR is defective. Scienti c founder Robert Tarran discovered how defects in CFTR lead to excessive ENaC activity. Namely, the inability of defective CFTR to conduct chloride and bicarbonate ions results in the airway surface uid becoming acidic. The acidity in turn causes a conformational change in SPLUNC1 (BPI fold containing family A member 1; BPIFA1; PLUNC; LUNX), a secreted protein that normally binds to and deactivates ENaC by causing its subunits to dissociate and internalize. The conformational change in SPLUNC1 makes its ENaC binding domain inaccessible, which allows ENaC to be activated by proteases. Spyryx is developing small peptides based on the SPLUNC1 ENaC binding domain to prevent ENaC activation. “When you isolate the regulatory peptide from the rest of the protein, it maintains its binding a nity for ENaC, but it’s pH independent,” said CEO John Taylor. In 2013, Tarran’s group at the University of North Carolina at Chapel Hill and researchers from the University of Lausanne reported in the American Journal of Physiology Lung Cellular and Molecular Physiology that an 18-amino-acid peptide derived from SPLUNC1 inhibited ENaC conductance in CF human bronchial epithelial cultures and produced a mean airway surface liquid depth of 7.9 μm, which is comparable to non-CF bronchial cultures. Untreated CF bronchial cultures had a mean airway surface liquid depth of 4.2 μm. Taylor said Spyryx is optimizing versions of the peptide that contain about 12 amino acids. Taylor said Spyryx has performed preliminary comparative testing that suggests the peptides could have greater e cacy than CFTR modulators, but also do not interfere with CFTR modulators’ activity. Thus, the peptides may complement CFTR modulators the same way CFTR and ENaC work together to regulate airway hydration in the normal lung. Unlike mutation-speci c CFTR modulators, the peptides wouldn’t be restricted to speci c genotypes. “Because we’re not working on the channel that’s mutated and are directly addressing airway uid regulation, our belief is that our therapy should have a universal e ect,” he said. At least one other ENaC inhibitor is in the clinic for CF. P-1037 from Vertex Pharmaceuticals Inc. and Parion Sciences Inc. is a small molecule in Phase IIa testing to treat CF regardless of genotype. Vertex and Parion declined to provide more information. Taylor said small molecule inhibitors of ENaC risk causing diuresis and hyperkalemia if they enter circulation and reach ENaC in the kidney, which may be less likely with Spyryx’s peptides. “It is our belief that they are not crossing into the bloodstream in a material way, and what does is rapidly cleaved and cleared from circulation,” he said. He said Spyryx’s peptides also may have durable e ects because they both inhibit and degrade ENaC. Spyryx also plans to research the peptides’ ability to treat chronic obstructive pulmonary disease (COPD). Taylor said Tarran and others have shown that cigarette smoke may cause a CF-like condition by interfering with CFTR on airway epithelial cells. Spyryx has an exclusive worldwide license to IP from UNC-Chapel Hill covering composition of matter and methods of treatment using SPLUNC1 and its derivatives. The university holds equity in Spyryx and is eligible for milestones and royalties. In May, Spyryx raised an $18 million series A round to advance at least one candidate into the clinic. Spyryx also received an award of an undisclosed amount from Cystic Fibrosis Foundation Therapeutics Inc. in June to support development of the peptides. A timeline for entering the clinic is not disclosed. Additionally, a rheology data analysis of human sputum samples shows lower stress reduction from control for AIR DNase compared to Pulmozyme. The mean viscosity reduction as a measure of activity on patients’ sputa by AIR DNase is 70% compared to 30% for Pulmozyme. SYGN113 works by thinning and clearing thick mucus from the lungs. It also breaks up bacteria biofilms and suppresses inflammation. Cilia and mucus help keep bacteria and harmful substances from entering your lungs. In cystic fibrosis (CF), the mucus is thick and viscous, preventing free movement of the cilia, and allowing bacteria colonies to form biofilms and cause chronic inflammation. 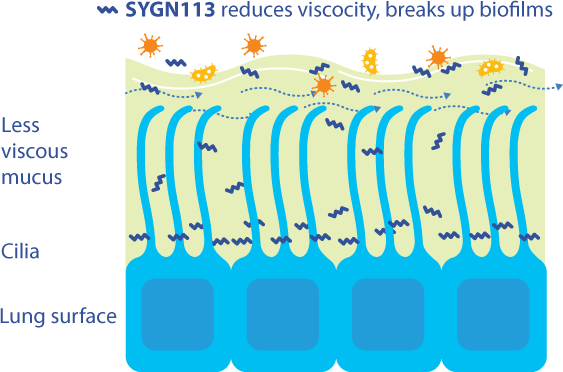 The modified polysaccharide drug SYGN113 interacts with the native glycoproteins in the mucus and polysaccharides in the biofilms to reduce mucus viscosity, break up biofilms, and provide an anti-inflammatory barrier to promote healing of the lung mucosal surface. Treatment with nebulized Theradux, which relaxes abnormally stiffened mucus, is anticipated to help restore mucus transport and clearance in the majority of CF patients. QR-010 will be taken as a regularly inhaled therapy and is designed to work in a unique way. Unlike any other CF drug currently on the market it aims to repair the genetic defect in the RNA. The RNA is the “blueprint” for protein synthesis. By repairing this “blueprint” a normal healthy CFTR protein will be formed that is expected to have normal function. The goal of QR-010 is to repair the underlying defect in the RNA and with that stop the progression of cystic fibrosis. ProQR is developing an investigational product for cystic fibrosis patients that suffer from the ΔF508 mutation, called QR-010. ΔF508 is the most common mutation in cystic fibrosis that affects more than 70% of all CF patients. ProQR has started the first clinical trial of QR-010 in CF patients. The phase 1b clinical trial that started in June 2015 will assess the safety and tolerability of QR-010 in 64 patients that are homozygous for the ΔF508 mutation. In this study we will also look at some measures of efficacy that are commonly used to see if a medicine is beneficial in cystic fibrosis patients. The second study is a nasal potential difference, or NPD, study in 16-32 patients that are either homozygous or compound heterozygous for the ΔF508 mutation. This study started in September 2015 and is a proof of principle study with the aim to evaluate the efficacy of QR-010, as we have successfully shown in similar pre-clinical studies. Very nice Annual Report describing their work and ambition, worth reading! Shire’s goal is to deliver mRNA that codes for a fully functional (wild type) version of the CFTR protein to the lungs of CF patients. Messenger RNA (mRNA) is a natural material produced by living organisms to convey coded genetic information from a gene (DNA) to the ribosome, which translates the coded genetic information into protein. In many diseases, the underlying cause is the lack of sufficient levels of functional protein. Shire is investigating therapies in its preclinical pipeline which would deliver mRNA to sites in the body where it can be used by the body’s own cellular mechanisms to produce normal working copies of the protein. CFFT has committed to up to $15 million to support Shire’s mRNA technology platform for CF. In CF, mutations in the CFTR gene (Cystic Fibrosis Transmembrane Conductance Regulator) lead to a disruption of the normal regulation of fluids in the lung that cause the secretions to thicken, thereby restricting lung function and leading to recurrent lung infections. Shire’s goal is to deliver mRNA that codes for a fully functional (wild type) version of the CFTR protein to the lungs of CF patients. If high enough levels of functional CFTR protein can be produced, lung function may be improved, thereby reducing the frequency and severity of infections. Shire is also investigating other diseases that are caused by a lack of sufficient levels of a functional protein and where the Company may be able to leverage its mRNA Technology platform. Shire will highlight its mRNA platform at today’s R&D Day. Moderna’s pioneering mRNA Therapeutics™ are designed to trigger the cellular machinery to utilize their natural processes to produce functional proteins. mRNA Therapeutics may be developed to enable the delivery of correct genetic instructions into cells in the lungs, which may trigger the cells to produce functional CTFR protein. This mRNA-based approach could be applicable to any person with CF regardless of a person’s specific CFTR mutations. mRNA is responsible for carrying genetic instructions transcribed from DNA, which cells then translate to produce proteins that, when defective or missing, can underlie certain diseases, including CF. Moderna’s pioneering mRNA Therapeutics™ are designed to trigger the cellular machinery to utilize their natural processes to produce specific functional proteins. Through this collaboration, mRNA Therapeutics may be developed to enable the delivery of correct genetic instructions into cells in the lungs, which may trigger the cells to produce functional CTFR protein. This mRNA-based approach could be applicable to any person with CF regardless of a person’s specific CFTR mutations. Moderna currently has two Phase 1 clinical studies underway of mRNA vaccines for the prevention of infectious diseases. The company has over 90 discovery programs advancing across its ecosystem of therapeutically focused ventures and external partners that span rare diseases, infectious diseases, cancer and cardiovascular disease, among others. The Wave 2 product (CF gene delivered by a lentivirus) that the Consortium has developed in parallel with Wave 1 over the last decade is now progressing rapidly. First CF patient treated 2016/2017 according to latest video! Vertex Pharmaceuticals Incorporated and CRISPR Therapeutics today announced that the two companies have entered into a strategic research collaboration focused on the use of CRISPR’s gene editing technology, known as CRISPR-Cas9, to discover and develop potential new treatments aimed at the underlying genetic causes of human disease. The collaboration will evaluate the use of CRISPR-Cas9 across multiple diseases where targets have been validated through human genetics. Vertex and CRISPR will focus their initial gene editing research on discovering treatments to address the mutations and genes known to cause and contribute to cystic fibrosis and sickle cell disease. Vertex and CRISPR will also evaluate a specified number of other genetic targets as part of the collaboration. Under the terms of the collaboration, Vertex and CRISPR will jointly use the CRISPR-Cas9 technology to discover and develop potential new treatments that correct defects in specific gene targets known to cause or contribute to particular diseases. The initial focus of the collaboration will be on the use of CRISPR-Cas9 to potentially correct the mutations in the cystic fibrosis transmembrane conductance regulator (CFTR) gene known to result in the defective protein that causes CF and to edit other genes that contribute to the disease. Additionally, the companies will seek to discover and develop gene-based treatments for hemoglobinopathies, including sickle cell disease. Additional discovery efforts focused on a specified number of other genetic targets will also be conducted under the collaboration. Discovery activities will be conducted primarily by CRISPR, and the related expenses will be fully funded by Vertex. Vertex has the option to an exclusive license for up to six gene-based treatments that emerge from the four-year research collaboration. Vertex will fund 100 percent of the development expenses of licensed treatments. For each of the up to six treatments in-licensed for development, Vertex will pay future development, regulatory and sales milestones of up to $420 million as well as royalty payments on future sales. Vertex and CRISPR will collaborate on the research, development and commercialization of treatments for hemoglobinopathies that emerge from the collaboration. Specifically for hemoglobinopathies, including treatments for sickle cell disease, Vertex and CRISPR will equally share all research and development costs and sales, with CRISPR Therapeutics leading commercialization efforts in the U.S. For all other diseases, Vertex will lead all development and global commercialization activities. Vertex will pay CRISPR $75 million in cash as part of its up-front commitment. Vertex will also provide a $30 million investment in CRISPR, which is a private company. The investment will provide Vertex with an ownership stake in CRISPR. The collaboration also provides Vertex with an observer seat on the CRISPR Board of Directors, which will be filled by Dr. Altshuler. “CRISPR” refers to Clustered Regularly Interspaced Short Palindromic Repeats that occur in the genome of certain bacteria, from which the system was discovered. Cas9 is a CRISPR-associated endonuclease (an enzyme) known to act as the “molecular scissors” that cut and edit, or correct, disease-associated DNA in a cell. A guide RNA directs the Cas9 molecular scissors to the exact site of the disease-associated mutation. Once the molecular scissors make a cut in the DNA, additional cellular mechanisms and exogenously added DNA will use the cell’s own machinery and other elements to specifically ‘repair’ the DNA. This technology may offer the ability to directly modify or correct the underlying disease-associated changes in the human genome for the potential treatment of a large number of both rare and common diseases. Helping the “gates” open more often and thereby helps the CFTR proteins at the cell surface to work better. ORKAMBI is made up of lumacaftor and ivacaftor. Same function as Orkambi but seems to be slightly more efficient and easier to onboard for patients. Vertex is taking the game to the next level with this one. They are adding a third corrector to their corrector / potentiator setup to increase the effect. TP-656 is a novel potentiator that may enable once-daily dosing and was developed by applying deuterium chemistry to modify ivacaftor. Concert is initially developing CTP-656 as a potential treatment for cystic fibrosis as monotherapy in class III (gating) mutations (e.g. G551D) of the gene that encodes for cystic fibrosis transmembrane conductance regulator (CFTR), a protein which regulates components of sweat, mucus clearance and digestion. In a Phase 1 cross-over comparison of CTP-656 and Kalydeco, CTP-656 demonstrated a superior pharmacokinetic profile compared to Kalydeco including a reduced rate of clearance, longer half-life, substantially increased exposure and greater plasma levels at 24 hours. The Phase 1 multiple ascending dose study was initiated in the fourth quarter of 2015. N91115 works through a novel mechanism of action called GSNOR inhibition that is presumed to modulate the unstable and defective CFTR protein responsible for CF. GSNOR inhibition restores GSNO levels thereby modifying the chaperones responsible for CFTR protein degradation. This stabilizing effect increases and prolongs the function of the CFTR chloride channel and leads to an increase in net chloride secretion. Nivalis Therapeutics has completed clinical studies with N91115, including a Phase 1a dose-escalation safety study in healthy volunteers, and a Phase 1b safety study in people with CF who have two copies of the F508del mutation. In preclinical studies, N91115 has been shown to increase the function of F508del-CFTR, the mutant protein that is estimated to be present in approximately 86 percent of people with CF in the United States and Europe. Riociguat is a novel therapy that stimulates sGC, an enzyme in the cardiopulmonary system and the receptor for nitric oxide (NO). Preclinical data has shown evidence that riociguat can result in improved CFTR channel expression. GLPG1837 has completed a Phase 1 clinical trial, with good safety and tolerability in that study. Galapagos is preparing to initiate a Phase 2 study with GLPG1837 in Class III mutation patients by year end 2015. Our first oral corrector candidate, GLPG2222, is anticipated to start a Phase 1 trial before the end of 2015. We nominated a second corrector candidate in October 2015, GLPG2665, the first of a number of C2 correctors to work with our C1 corrector GLPG2222 and our potentiator GLPG1837 in a potential triple combination therapy. We aim to have CLPG2665 in a Phase 1 trial by mid-2016. We consistently achieve healthy levels of activity in HBE delF508 (Class II) homozygous cells in vitro with this triple combination of compounds, and up to a 6-fold greater restoration of CFTR than Orkambi® in vitro. These results are suggestive of a compelling therapeutic option for these patients. We believe that our CF combination therapy addresses unmet need in both homozygous and heterozygous Class II patients. Our pre-clinical data also suggest activity of our CF drugs in combination with messenger ribonucleic acid, or mRNA, translation modulation drugs in the Class I mutation, the first indication of a broader spectrum of patients to be addressed with our robust CF program. QBW251 is a type of CFTR Modulator called a “potentiator”, similar to the drug ivacaftor, this drug would help to facilitate the opening of the chloride channel on the cell surface. This compound is administered through an oral pill. Proteostasis Therapeutics, Inc. (PTI) include the addition of a novel triple combination therapy of PTI’s own CFTR amplifiers, correctors and potentiators. PTI’s testing has shown that a triple combination comprising a proprietary corrector and potentiator, currently in late lead optimization stage, and one of PTI’s CFTR amplifiers, can restore the activity of mutant F508del CFTR protein to 80% of normal activity in Ussing chamber assays. The components of the triple combination were developed internally using the Company’s proprietary Disease-Relevant Translation, or DRT™, platform. The screening assay was optimized to identify novel CFTR modulators that show functional synergy with the Company’s lead drug candidate, PTI-428, which belongs to a novel class of CFTR modulators the Company refers to as “amplifiers”, while restoring chloride currents above levels achieved by existing commercially available products. In Ussing chamber assays, one PTI potentiator, PTI-P271, has shown comparable efficacy with Vertex Pharmaceuticals’ (Vertex) potentiator, ivacaftor, and did not cause F508del CFTR protein destabilization under chronic administration conditions when combined with a PTI corrector. Also in Ussing chamber assays, one PTI corrector, PTI-C1811, has been shown to restore at least 140% of CFTR functional levels relative to Vertex’s corrector lumacaftor, which is currently marketed together with ivacaftor as Orkambi™. Based on the data generated in the human bronchial epithelial (hBE) cells homozygous for the F508del mutation, the Company believes that the combined use of the three molecules has the potential to restore mutant CFTR function in CF patients homozygous for the F508del mutation to approximately 80% of normal activity. Further, PTI-C1811 and PTI-P271 combined have demonstrated higher levels of CFTR function in vitro than Orkambi™. PTI is advancing its CFTR amplifier PTI-428 as its lead clinical development candidate for the treatment of CF and expects to file an IND with the FDA by the end of 2015. The PTI correctors and potentiators are expected to enter clinical development by the middle of 2017. In 2017, Vanda intends to complete the technology transfer activities from UCSF and initiate IND enabling studies for several CFTR indications. FDL has a robust pipeline of CFTR “correctors,” “potentiators,” and “2nd generation modulators” as well as backup compounds for each of these approaches. FDL169 has been in multiple Phase I clinical trials in both healthy volunteers and patients with CF. FDL176 is also in clinical development. We continue to optimize our “second generation correctors”.